If you or someone you love has been diagnosed with prostate cancer, be assured that highly successful and minimally invasive treatments are available. Brachytherapy is a one-time, half-day procedure that allows you to resume normal activity within a day. During the procedure, tiny radioactive devices called "seeds" are implanted in the prostate gland to destroy the cancer from the inside, sparing the surrounding healthy tissue. With highly successful outcomes and fewer side effects, you have an outstanding chance of triumphantly beating prostate cancer. 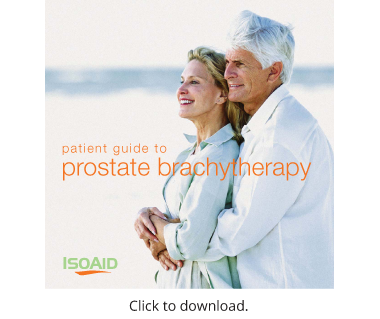 To learn more, please download our Prostate Brachytherapy Patient Guide. Your doctor may have suggested radiation if you have been diagnosed with ocular cancer. Plaque brachytherapy is the most widely used treatment for choroidal melanoma. With this process, a highly concentrated amount of radiation is delivered to the tumor in the form of small radioactive seeds. The seeds are the size of a small grain of rice and are attached to the eye within a small piece of gold. Eye Plaque brachytherapy is a vision-sparing outpatient procedure.